J.B. Mauney finished in a three-way tie for second place in Round 1 of the Atlantic City Invitational with 87.25 points on Hot Rod. Photo: Andy Watson/BullStockMedia.com. 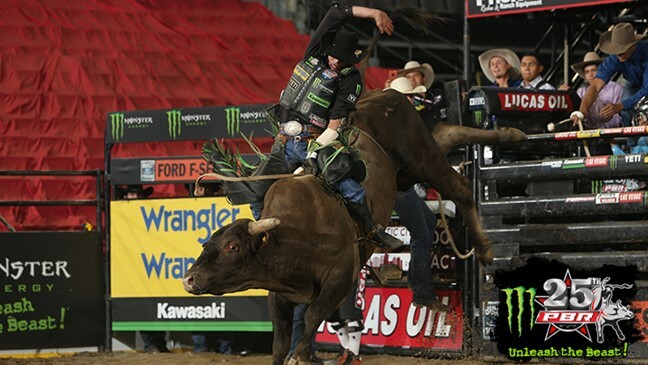 ATLANTIC CITY, N.J. – J.B. Mauney knows a thing or two about being a part of high-pressure World Championship races. However, one thing that has been new for him this season is being involved in the race at the bottom of the world standings. Mauney has been in a dogfight since the second half of the premier series resumed last month in Tulsa, Oklahoma, as a logjam of riders have been jockeying for Top 35 positioning. The two-time World Champion finally was able to break through on Saturday night in New Jersey, finishing in a three-way tie for second-place during Round 1 of the Atlantic City Invitational. Mauney (87.25 points on Hot Rod), Matt Triplett (87.25 points on Blue Stone) and Lachlan Richardson (87.25 points on Mickey Mouse) each earned 50 world points. Mauney moved from 36th in the world standings to 32nd. Triplett moved from 34th to 30th and Richardson went from 35th to 31st. There is less than 100 points separating No. 28 Joao Ricardo Vieira and No. 35 Marcos Gloria heading into Championship Sunday following the rides by Mauney, Triplett and Richardson. Round 2 can be seen on CBS Sports Network at 6 p.m. ET Sunday, as well as RidePass at 1:45 p.m. ET. Round 1 winner Marco Eguchi had begun the night ranked 30th before moving up to 27th. Mauney, Triplett and Richardson are the only riders among those eight riders on the bubble with a qualified ride, while No. 38 Alisson de Souza is sitting in 12th place with his 83-point ride on Sugar Boom Boom. Does Mauney feel like he has an advantage over the other bubble riders because of his championship pedigree? Mauney is coming off a fourth-place finish last week and he has ridden three of his last five bulls. The 31-year-old has begun to move his surgically repaired free arm with more and more ease the last two weeks. It has been 14 months since he sustained the career-threatening shoulder injury at the 2017 Calgary Stampede. Mauney flashed a smile when asked about the bubble riders picking up world points and rides on Saturday night.